“If there’s one thing we can be sure of,” said the man on the public address system this morning, “God is not a runner.” This may have been a little unfair, and possibly mildly blasphemous, but he had a point. 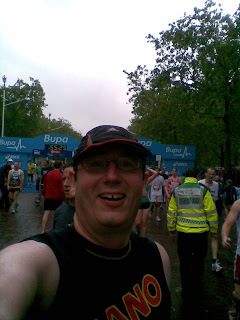 As I crossed Green Park to reach the starting pens of this morning’s 10k race on Birdcage Walk, the heavens were open and rain was tumbling from the sky. 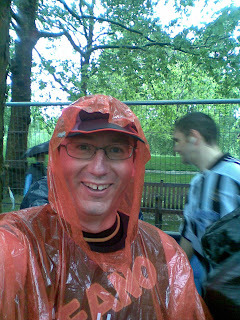 Luckily, I was nattily dressed in a disposable poncho, but many of my fellow runners were not as well dressed. Being wet and cold is not a good way to start a race. For some reason unknown to me, the organisers had decided to place me in the front pen, just behind the elite runners. When I questioned this, one of the marshalls reassured me that I was in the right place. “Anyone who expects to finish in under an hour is in this pen,” she told me, “The other pens are for the fun runners.” In one wonderful moment I had been promoted from fun runner to serious runner. The day of the veteran plodder had finally come. This was confirmed for me when I found myself lined up next to a completely naked (bar very small thong) man, painted green. Clearly, I was running, if not with the elite, with the cream of British athletes. It was actually a great run. Once we had all warmed up, it was clear that those around me were enjoying the morning. There was little not to enjoy. It was a relatively flat course and one that had plenty of sights to keep us interested. There were fewer crowds than expected, but considering the dreadful weather this was hardly surprising. The promised bands to spur us on were all there, if set up some way back from the road, sensibly under cover. Before I knew it I was running through Leadenhall Market and well on my way home. The only bad moment was when, just after the 8k marker, I was overtaken by a banana. I think his name was Toby. The finish on the Mall was tremendous. We entered it from the opposite end to the London Marathon, having skirted Trafalger Square and run under Admiralty Arch. This meant that we ran towards Buckingham Palace. This will certainly make a fitting end to the 2012 Marathon, a the closing stages of whose course we were, apparently, trying out. The marshalls at the end of the course, though cold and wet, were smily and welcoming – just as they had been all around the streets of Westminster and the City. A final time of just under 54 minutes was creditable. A jolly medal (no date though, surprisingly), a tee shirt and several bits to munch and drink in the goody bag. And it was really nice to be met at the end of the race by Steve and Lynn who had braved the elements to come and join me at the finish. All in all, a very good day.